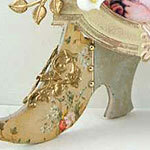 Elegant woman's slipper shape, laser-cut in sturdy, kraft-colored, acid-free chipboard (1mm thick). Has a lovely Louis heel (and I wonder how comfortable shoeswere when the heels were shifted forward to the arch of the foot). Just fits within an ATC (2-1/2" x 3-1/2"). 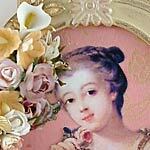 Perfect for Marie Antoinette or Madame de Pompadour projects. Artwork by Design Team Member Laura Carson; for more info see the Making a Chipboard Shoe Picture Stand tutorial!